Providence's relay team of Zaria Dunlap, Ariana Rivera, Ella Mainwaring-Foster and Nimeesha Coleman took 6th place earning All-American status in the 1000m Swedish Relay. Their order for 100-200-300-400 is the same order listed above. Dunlap handed off to Rivera who got the baton and had to break coming off the curve out from lane 7. As Rivera handed off to Mainwaring-Foster for the 300m leg they sat in the middle of the pack as top squads in Western Branch and Nansemond River began to pull away from the field. Mainwaring-Foster handed off in 5th to Coleman. With fast times in the previous sections, Coleman would have to move up to ensure an All-American spot. Coleman got out hard immediately passing the competitors just ahead of her. She would hold onto her position taking 5th in their heat in 2:15.44. They'd beat all teams in the previous three sections but one and took home an All-American finish! Providence will have the 4x400m and 4x200m Relays remaining this weekend as well as some individual events. Christian Landis (Providence Day) and Jack Dingman (Northern Guilford) have both had historic freshman years heading into the meet with PRs of 9:30.83 for Dingman and 9:36.64 for Landis. Good for US#6 and US#14 amongst freshman this track season. Dingman has been a frontrunner this season and did just that in the 2 mile taking the pace pretty much from the gun. Landis sat just off of Dingman with Andrew Schultz (TN) hanging on with them throughout the race. It was pretty much down to these three boys through the Mile in 4:45. With about 1000m remaining Landis took over the lead from Dingman. Dingman and Schultz tried to hang on, but Landis slowly edged away from the field. He'd go onto take the win in 9:38.25 for the full 2 Mile, which will convert to a brief 3200m PR of 9:34.90. Dingman would finish behind Schultz taking 3rd in 9:47.30. The future is certainly bright for North Carolina distance running as these two studs capped off a remarkable freshman year. In an interview after the race, Landis predicted fellow North Carolina star Cameron Ponder to win the Championship final on Sunday. Garner sophomore Jonah Ross threw down in the prelims of the Girls EE 100m Dash as she was the second-fastest qualifier running a new seasons best of 11.74 which is good for NC#2. In the finals, Ross was going to have to run best than that if she was going to take the EE title with Kimberly Harris (GA) setting the new EE 100m Dash meet record with an 11.65. The finals went off, and Ross had a great start, but the field was in contention with Alia Armstrong right by her side. Ross dipped at the line and was able to hold off the field clocking a new PR and NC#2 time of 11.60. Ross will still compete throughout the summer months, but this is a phenomenal showing for Ross who missed the Indoor season due to injury. The performance will go down as NC#12 All-Time in State history and is a new Emerging Elite Meet record! Hillside competed in the debut event of the Mixed 4x400m Relay and brought home a heat win that was good for a 4th place All-American finish. 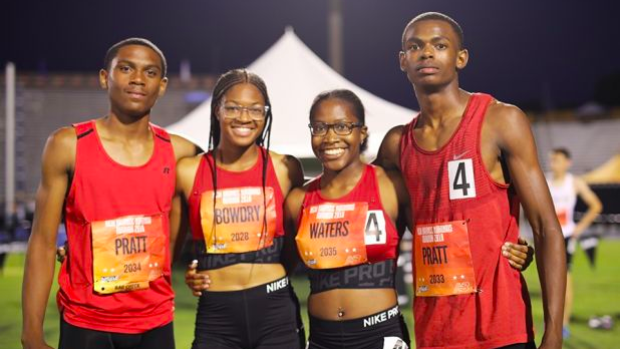 Their team of Emmaya Waters, Kacey Pratt, Ashlan Bowdry and Korey Pratt clocked 3:33.96 as they won their heat by over 2 seconds. The event was unique as every school had to run two boys and two girls, through you could run and order you'd like. So strategy was a big part of that event. Hillside ran Girl-Boy-Girl-Boy as the majority of schools ran with a boy on the anchor leg. However, Western Branch, who finished 1-2 in the field, ran a contrary strategy to the field running Boy-Boy-Girl-Girl winning in 3:28.11. This is a really fun event and I hope the NSAF will keep it in their national championship meet for years to come. Caroline Walters (Metrolina Christian Academy) came up just short of the Emerging Elite Javelin win with a best throw of 121-4! The winning mark was 125-9 from Shannon Ziccarello (NJ). Walters best throw coming in was 110-5 as she threw almost an 11 feet PR at the National meet. The performance would have been good for 13th in the Championship section. Her mark will also go down as NC#4 All-Time in the event. Also, in day 1 of the Heptathlon Timara Chapman (Leesville Road) sits in third place with marks of 14.92 for the 100mH, 5-6 for the HJ, 30-7.75 for the Shot Put and 24.98 for the 200 meters. She is just 87 points out of first place as she should certainly finish in an All-American spot. Seth Rabinowitz (Providence) and Patrick Freeman (Mount Tabor) placed 4th and 6h in the Emerging Elite Pole Vault with a mark of 15-3.5, moving Freeman up to NC#5 this season. Jirah Sidberry (Rocky River) placed 3rd in the Emerging Elite Triple Jump with a mark of 38-11.75. Alex Nunley (Garner) ran a 10.72 in the prelims, then a 10.74 in the Freshman 100m Dash finals for the best two marks of his career so far. Nunley took 2nd overall in the event. Lia Love (Jordan) clocked an 11.89 in the Freshman Girls 100m Dash Finals as she took 4th overall, just .08 seconds out of 1st place and good for NC#8 this outdoor track season!